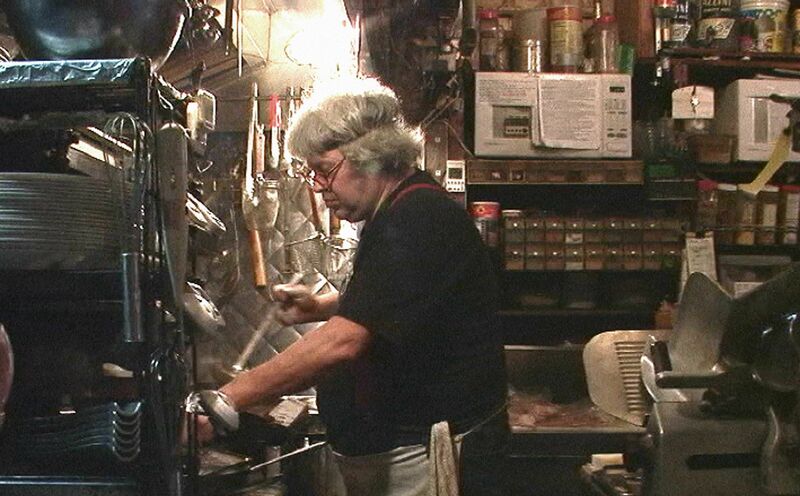 Until gentrification forced him to relocate, Kenny Shopsin ruled over his Greenwich Village eatery Shopsin’s for 32 years like an eccentric, profane, demanding, and yet benevolent culinary dictator, vigorously enforcing his unusual rules (such as absolutely no parties of five), befriending regular patrons, and creating an atmosphere as chaotic, bizarre, and strangely inviting as the 900 fusion food items—all created and cooked by Shopsin himself—offered on the menu. A truly idiosyncratic joint whose tiny kitchen was as narrow as a submarine corridor and filled with makeshift contraptions, devices, and enhanced equipment that might have sprung from the mind of Terry Gilliam or Jean-Pierre Jeunet, Shopsin’s was an environmental reflection of its creator, a verbose gastronomic mad scientist with white tussled hair, red suspenders, and a mouthful of philosophical ideas about life, love, family, and humanity. Capturing Shopsin on the eve of his 2002 move to a more traditional, sterile location a few blocks away, Matt Mahurin’s I Like Killing Flies utilizes extreme close-ups (sometimes with microphones in clear view) to create an appealingly informal aesthetic of proximity, his in-your-face cinematography granting the film an intimacy that accurately reflects the short-order chef’s close relationship with both his customers and his establishment. “There’s nothing wrong with being not so terrific,” Shopsin opines, and true to form, the overweight, messy man occasionally comes off as a severely and unreasonably demeaning loudmouth. Still, his adherence to a strict code of highly personal ethics and morality bestows his pronouncements about parenthood and altruism—as well as his touching confession, via a roach-in-the-soup story, about the importance of respecting and valuing those he serves—with an admirable honesty. In the diatribe that gives Mahurin’s film its (off-putting) title, as well as a similar reference to Woman in the Dunes, Shopsin candidly expresses the plight of working-class iconoclasts for whom life (and the fulfillment of one’s work) entails dealing with a steady stream of burdensome obstacles. In this regard, the short-order maestro’s eventual transfer to another neighborhood comes across as an injustice perpetrated against a powerless man by heartless businessmen and callous market forces. Yet despite being an elegy for the end of an era, I Like Killing Flies is too shrewd to view such developments as merely negative, Mahurin’s perceptive documentary ultimately matching its admiration for Shopsin’s staunch individuality with an acute awareness of how self-created comfort zones can also sometimes become inhibiting prisons.